I first became interested in this dessert when my wife and I spent a long weekend in Brooklyn last year. We were in NYC to help my brother at the Fancy Food Show, but we were staying in Brooklyn Heights. We ended up going for a walk to find the Ample Hills Creamery nearby. They only had a few unique flavors, so I tried their Ooey Gooey Butter Cake Ice Cream. 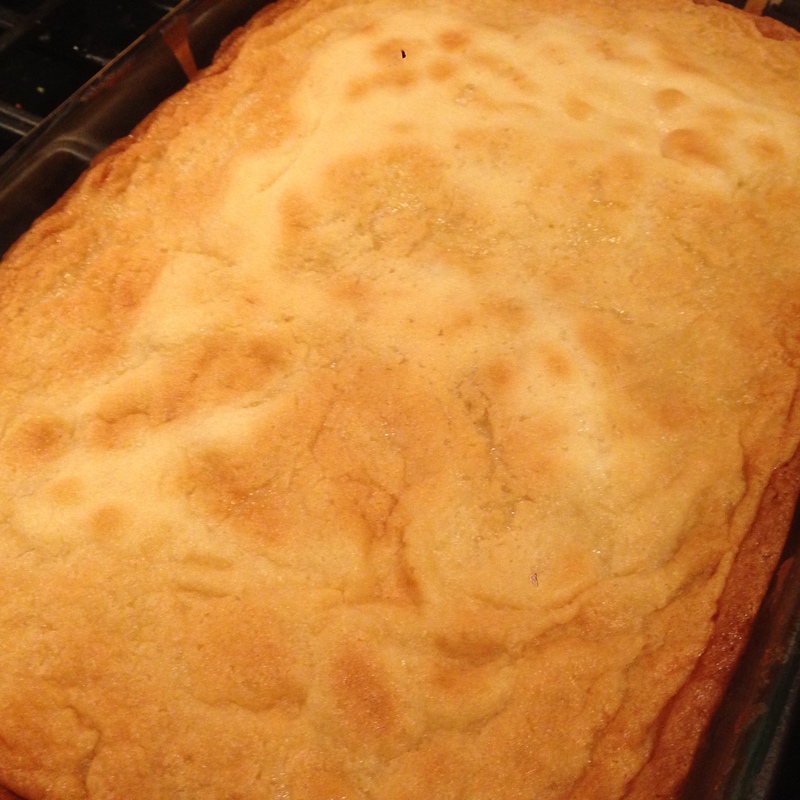 It was awesome, and the chunks of gooey butter cake were mildly addicting. So, I kept the idea in the back of my mind. My wife and I have a favorite dinner spot near our place that serves a prix fixe menu. They outsource their desserts (still very good), but for the spring/summer menu, they typically have a gooey butter cake with strawberries. So, every time we go and it’s on the menu, I get reminded that I have to try and make one myself. 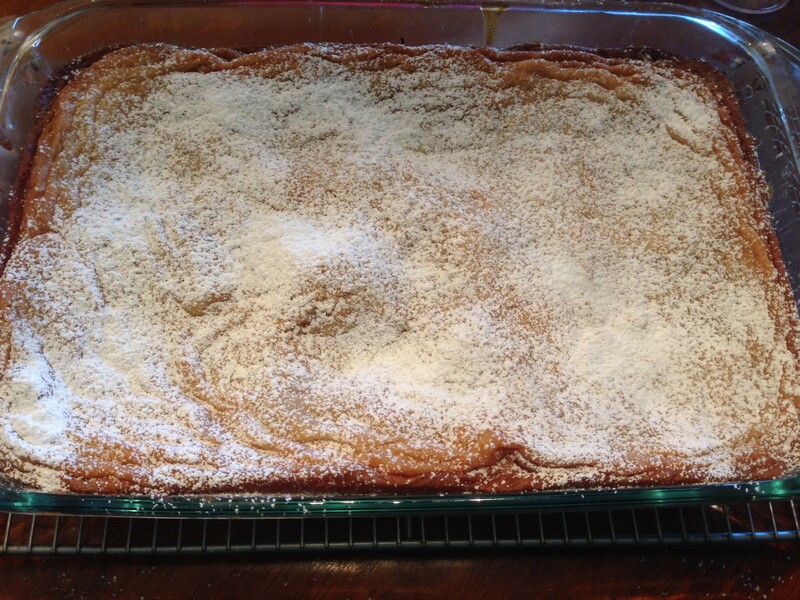 The history of the gooey butter cake is interesting, and there are a lot of different recipes out there. Many of these recipes take a short cut and use a yellow cake mix and evaporated milk or cream cheese (including the Ample Hills Creamery flavor), but this recipe appeared to be closest to the original. It’s a little bit more labor intensive because of the yeasted dough, but it’s actually easy to make. I thought it would be a different kind of dessert to have after a late lunch that I could make into a pseudo-strawberry shortcake. So, I made a strawberry ice cream to pair with the butter cake. This was strawberry shortcake on steroids, if you will. Ha. It really is a delicious cake and the perfect dessert to bring to a potluck or a BBQ with some fresh fruit and whipped cream. I may have over-baked it a little bit. I should have taken a closer look into the over, as it didn’t appear as golden brown as it actually was. It was still awesome, though, and my wife’s grandmother leapt at my offer to give her the last two slices. In a small bowl, mix milk with 2 tablespoons warm water. Add yeast, then whisk gently until dissolved and slightly foamy. In an electric mixer, cream butter, sugar, and salt, scraping down the sides as necessary. Beat in the egg, and mix until combined. Alternately add flour and milk mixture (begin and end with flour) in 5 additions, scraping down the sides after each addition. Beat dough on medium speed until it begins to pull away from the sides, roughly 7 to 10 minutes. Press the dough into an ungreased 9″ x 13″ baking dish. Cover the dish with plastic wrap, put in the oven, turn on the light, and let the dough rise for 3 hours. Once dough has risen, preheat oven to 350 degrees. In a small bowl, mix corn syrup with 2 tablespoons water and the vanilla extract. In an electric mixer, cream butter, sugar, and salt until the mixture is light and fluffy, about 5 to 7 minutes. Scrape down the sides, then beat in the egg until incorporated. Alternately add flour and corn syrup mixture (begin and end with flour) in 5 additions, scraping down the sides after each addition. Spoon the topping in large dollops over the risen cake and use a spatula to spread it into an even layer. Bake for 35 to 45 minutes (keep an eye on it starting at 30), until top is golden brown and center is still liquid. Let the cake cool completely in the pan, then dust with powdered sugar.